If you’ve ever seen picture of buildings that look strangely like brightly colored blocks then you’ll be right at home in La Boca. The neighborhoods are literally built by stacking blocks on top of each other to form intricate and beautifully colored structures. They may not be the most structural sound places to live but I’m sure you’ll enjoy the view! 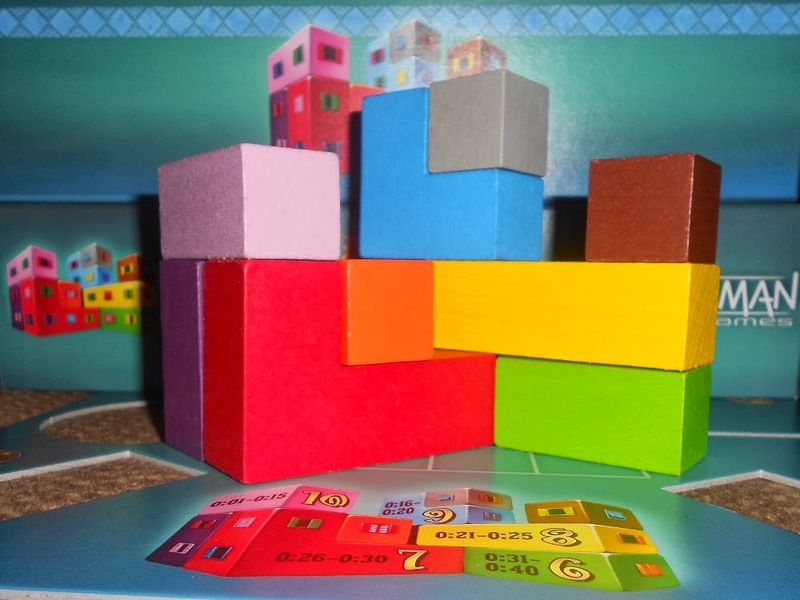 In La Boca the players are challenged to recreate skylines of a colorful neighborhood made up from the various blocks representing buildings. It’s what I’m going to refer to as a cooperative puzzle solving game. 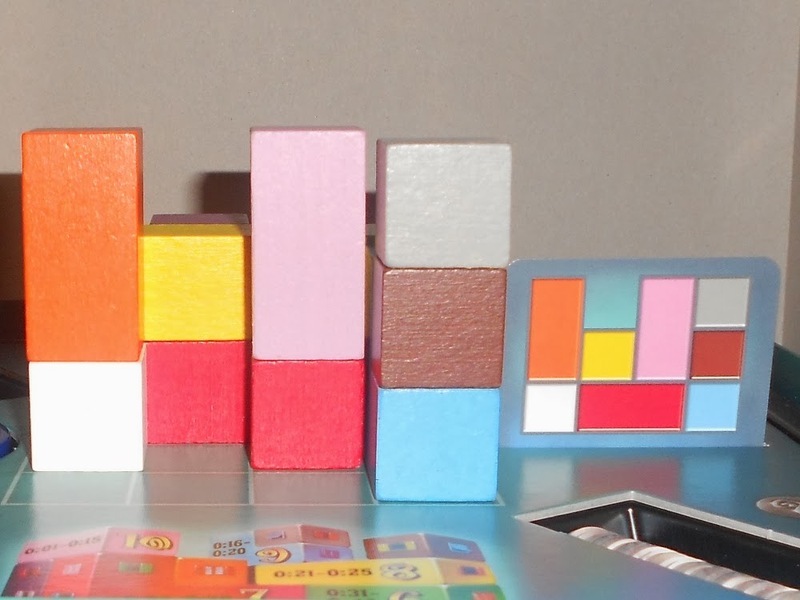 The puzzle part consists of a set of blocks in various sizes that need to be stacked into a 4×4 grid to satisfy a card telling you how the blocks should look once properly placed. Unlike most traditional puzzles you are not given enough information to solve the puzzle on your own and that’s where the cooperative part comes into play. 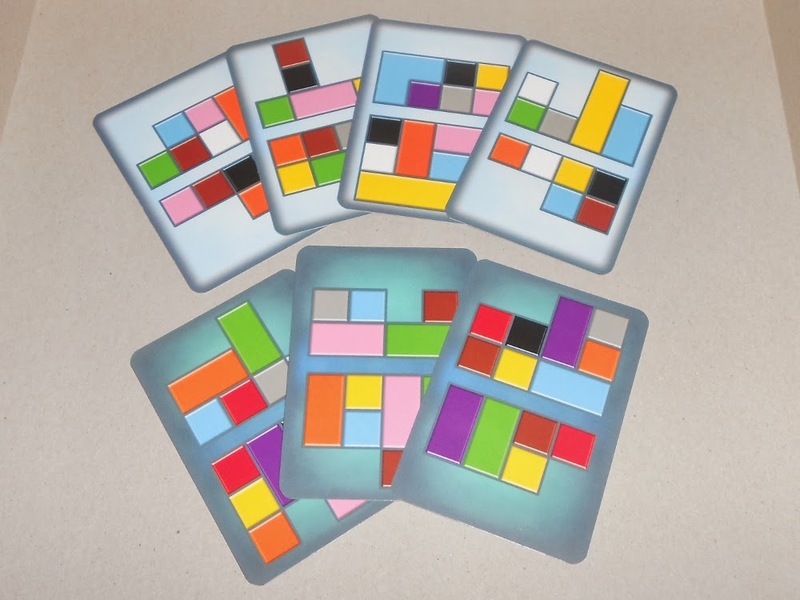 The puzzle cards are 2-sided with each side depicting the view of the structure from that player’s perspective. Partners position themselves across from each other on the table with the board (and card) between them. On the card you’ll see the solution from your side and your partner will be looking at the solution from their side. Neither of you has enough information to place all the blocks. 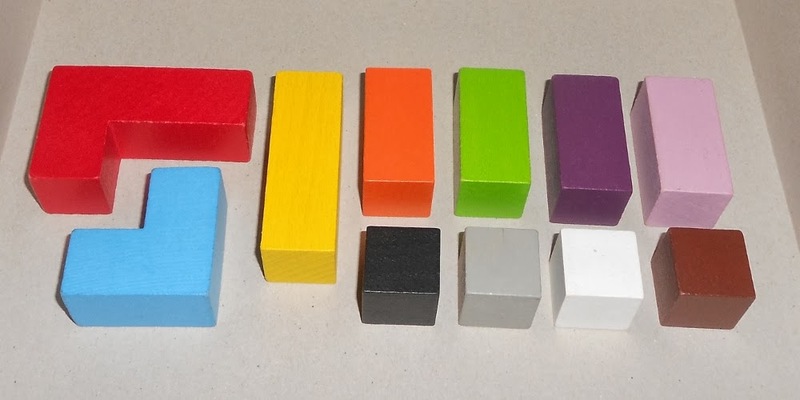 Some blocks are hidden behind those you can see and only your partner will know how to place them. Or perhaps there will be blocks that won’t show up on either side and will need to be hidden from both players. In order to correctly solve the puzzle you’ll need to work together with your partner to fill in what you don’t know. Communicating is crucial. You can say anything you want and do anything short of looking at your partner’s side of the card. Partners are encouraged to talk about where and how much of the blocks they can see and what blocks they can’t see. In addition to moving around the blocks to complete your side of the puzzle you can move those that your partner is working with to help them solve their half. There are a couple of rules that must be followed when placing the blocks. First, blocks may not go outside of the 4×4 grid found on the playing board. Next, all blocks must be used. 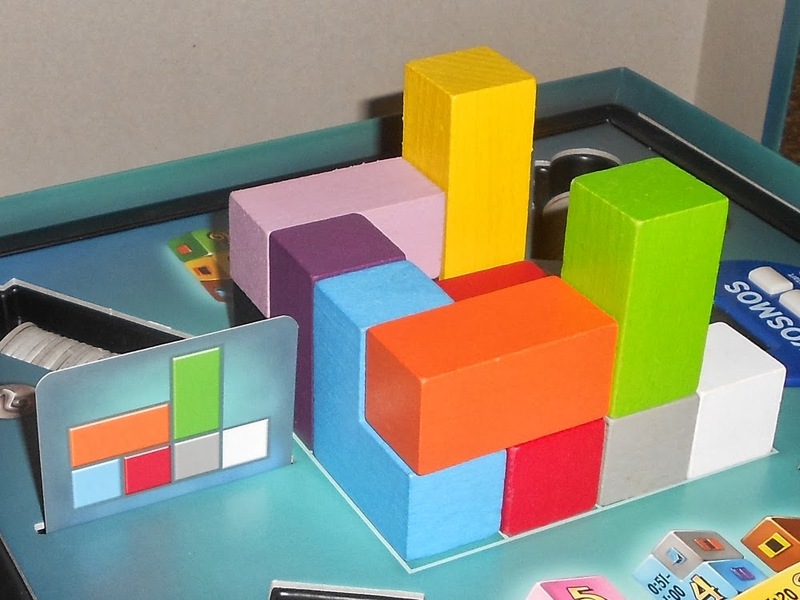 If neither player can see a color then those blocks must be placed in the middle so the view to them is obstructed by other blocks. Last, you can’t have any blocks that overhang an empty spot. Each block needs to have something underneath it completely supporting it. If any of these rules are not followed or the puzzle card is not completed correctly then that solution is consider to contain an error. 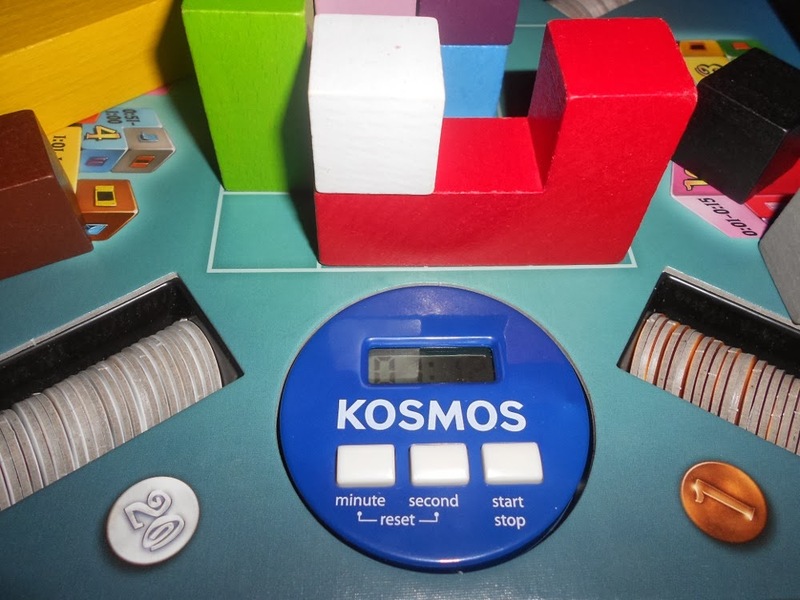 At the beginning of the game each player takes a large token to indicate their color as well as one small token matching each of the other players. The small tokens are placed face down. Then the starting player flips over one of their tokens to see who they will partner with that round and leaves it face up. Each round is timed to encourage players to solve the puzzle as quickly as possible. If a puzzle is solved with no errors then both partners receive points based on how quickly it was done. The next player in turn order then selects a partner in the same way and play continues until all the tokens have been revealed. This allows everyone to play with each other two times. The player with the most points at the end of the game wins. La Boca comes with two different difficulties of cards: regular and hard. The instructions encourage you to use the regular cards during your first game and then switch to using the hard cards once you are comfortable with the regular ones. 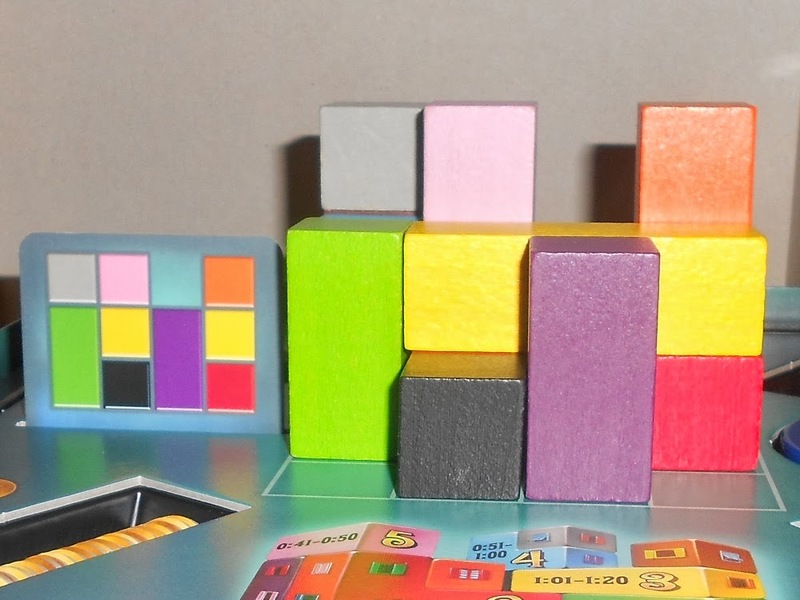 This is a great recommendation as the regular cards often leave enough wiggle room for placing the blocks so most players will be able to pick up on the game without getting too discouraged. The hard cards also include an additional larger “L” shaped red block which makes the game much more challenging. I would recommend sticking to the hard cards once you’ve learned the game as the regular cards will become a little too easy with experience. La Boca seems geared towards a broad audience, it has a lot of qualities that make it accessible to a variety of players. The rules are extremely simple and the regular cards make a great introduction to the game. I found that just having players try out a card or two and providing tips where they might be struggling is a fast and engaging way to teach the game. It is at its core a social game, you can’t solve the puzzles without talking to your partner so you’ll be just as engaged with the people you’re playing with as you are with the game. Even the bystanders can enjoy watching the active players struggle to solve the puzzle and communicate effectively or marvel as everything falls into place in record time. Rounds are quick so even if you go a couple rounds without being picked you won’t have to wait long before you’re back in the action. Even the design itself is bright and appealing. The blocks are chunky and easy to pick up and stack. The cards are sharp and easy to read. At times the purple and brown can look very similar but aside from that the colors are easy to tell apart. One of my favorite touches in the game is the box design itself. You actually take the lid off, slide it under the box, and use it to prop up the playing surface so that it’s easier to see from the perspective of the cards. Design choices like that (and the excellent insert) go a long way to making the game play smoothly. At first I wasn’t sure how much appeal La Boca would have with more casual players because it has a couple of elements that can be challenging, namely the spatial and timed components. This was not at all the case. In fact both of those things go towards making the game a smash hit in all the groups I played it with. La Boca fits very well into the niche of games that will appeal to most people but is still challenging and entertaining to gamers. The social aspect and timed rounds create a party game feel but the gameplay is all about solving puzzles. The thing that I was most concerned about, the spatial challenge of solving 3D puzzles, is actually incredibly intuitive and easy to teach. There aren’t very many blocks to begin with and the shapes are all simple so replicating the puzzles is actually quite natural for most players. The two different difficulties is great for introducing a natural learning curve to ease into how to play. The most challenging aspect is not visualizing how to solve the puzzles but doing so quickly. The pressure will sometimes make basic tasks quite a bit trickier and is itself the most difficult constraint that players face. What I think really makes La Boca appealing to casual players is the fact that even though you are competing with the other players for the highest score you don’t ever directly compete with anyone. You are actually working together with someone every time you take a turn and it creates a feeling of comradery. You are encouraged to always do your best because you’re never going to be helping anyone else more than yourself. The focus on teamwork keeps tension pretty much nonexistent but the scoring system still provides a winner. The bottom line is that it’s fun to play and you can be as competitive or casual as you want. I found it fascinating how La Boca mixed two very different skills, puzzle solving and communication. They aren’t strictly opposite but require two very different ways of thinking and most people will be stronger at one or the other. After playing with several different groups I’m not even sure which skill is more important. I did find that the puzzle solving aspect is much easier to learn with experience than good communication so the players that were better at communicating tended to do better in later rounds. The really interesting thing is watching how different pairs of players would go about solving the puzzles. Some players didn’t talk very much unless they had some key piece of information that needed to be worked out while others talked through everything that they were doing. It was fun to see how well certain people would work together. Couples tended to either click and solve puzzles very quickly or bicker and eat up precious time. Perhaps the most important quality to have, beyond puzzle solving and communication, is the ability to think quickly and stay cool under pressure. The highest score you can get is from solving a puzzle in 15 seconds or less which is quite fast. You need a sharp mind, nimble fingers, and a little luck to clock in at that speed. My attempt at recreating the box art! When I first started playing La Boca there were some cards that seemed to be quite a bit more challenging than others. They usually deal with hiding blocks or positioning the tricky “L” shaped blocks in specific ways. On a couple of occasions it would take a pair longer than the minimum time length of 2 minutes to solve a puzzle and often by that point the whole group would be trying to help get it done. The major reason that these tricky puzzles seemed so hard and would end up taking so much longer is that players would get stuck trying to rearrange the pieces. Once most or all of the pieces are in place it can be quite difficult to move everything around for one block that isn’t fitting quite right. Perhaps it’s obvious to the onlookers but under the pressure of the clock it can be easy to overlook the solution. What I did find was that good players could make almost any puzzle seem easy, as if they never got stuck with a “hard” puzzle. For that reason alone I didn’t find the variance between puzzles to be much of a problem. La Boca lends itself nicely to replayability. Every time I played there was a second game requested immediately afterwards because the frantic puzzle solving is addictive. You want to try for better times and a higher score. The group you’re playing with should also get better over the course of the game, seeing improvement is great incentive to continue playing. As for the number of puzzle cards, there are 32 per difficulty containing 2 puzzles each. Once you get past your first game you’ll really only be using the advanced cards so how long can you play with the same 64 puzzles? Luckily you’ll see at most 12 puzzles in a 6 player game so it would take quite a few games before you could effectively play all the puzzles. The chances that you’ll play all the puzzles before seeing repeats is unlikely since you’ll be skipping through the deck pretty quickly. Fortunately you probably won’t recognize a puzzle when seeing it for the second (or third) time let alone recall the solution. I would certainly welcome more puzzle cards, perhaps even more challenging ones, but I don’t think that the game needs them to find a long term spot in my collection. 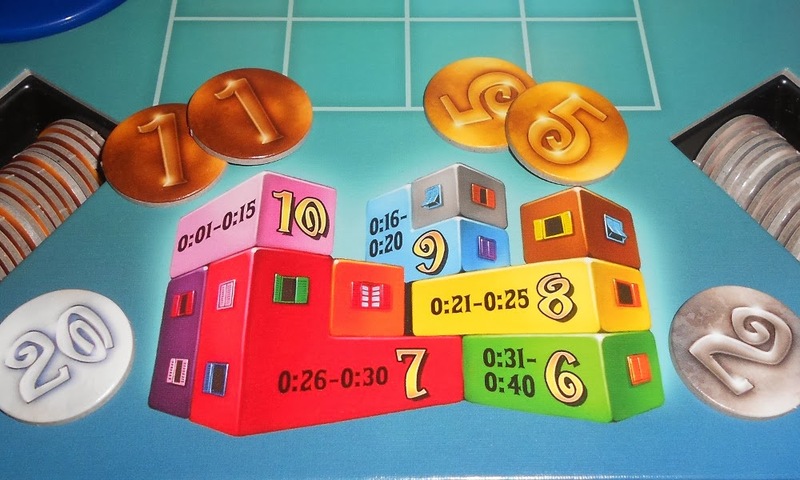 La Boca does have a bit of a novelty factor with its unique team puzzle solving gameplay and colorful pieces. My only concern would be if it got played heavily by the same group over a short period of time. I can’t speak on how it would hold up under those conditions but it’s probably best reserved as a filler or clever party game. The only downside that I can think of is that having one bad round can potentially knock you (and your partner) out of the running. It’s generally hard to tell who’s winning so you’ll still be able to enjoy the rest of the game but it could be somewhat discouraging. 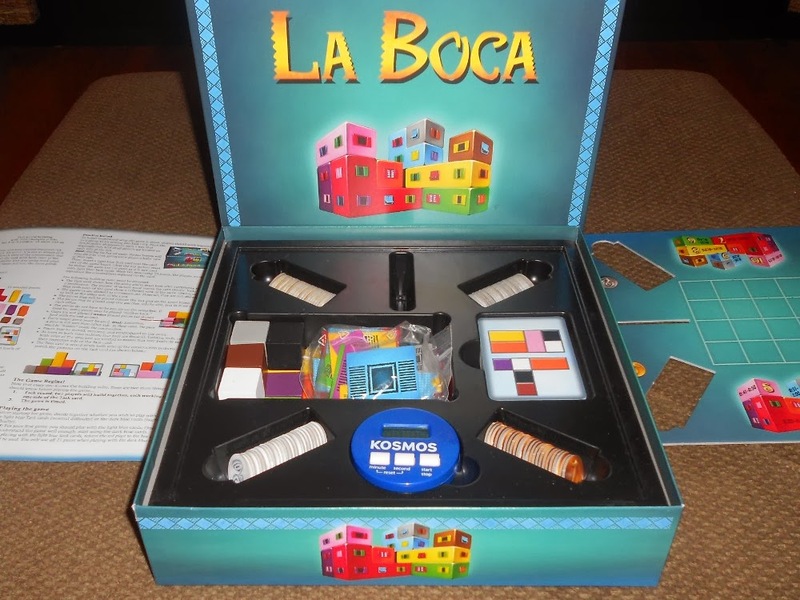 La Boca is an extremely clever game that combines puzzle solving and teamwork to create a friendly game experience while still allowing for a winner. Even though only two people are playing at a time the rounds are quick and the game is fun to both play and watch. You’ll find yourself having to hold back advice as you watch the puzzle solvers struggle and succeed at the colorful challenges that La Boca holds. It’s the perfect game to pull out at a party or family gathering to accommodate gamers and non-gamers alike. 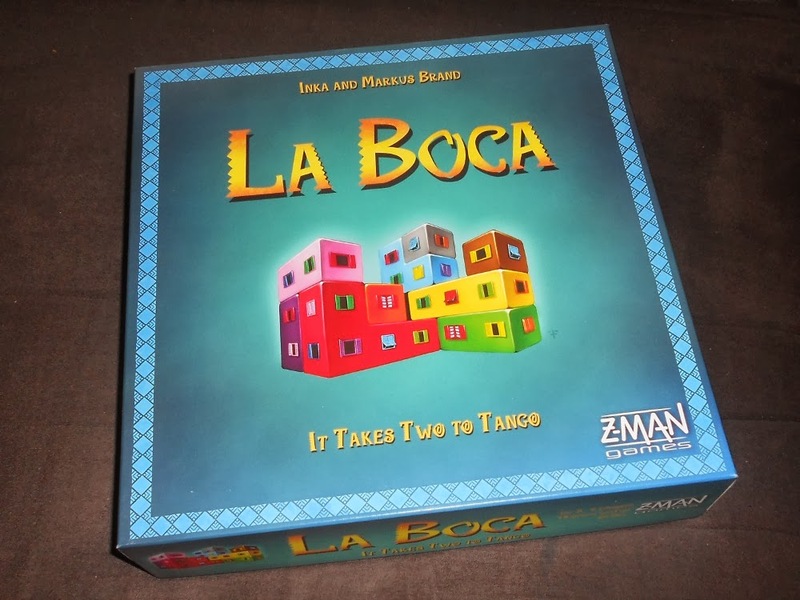 iSlaytheDragon would like to thank Z-Man Games for providing a review copy of La Boca. Saw Rodney Smith of Watch It Played talk briefly about this game. I don’t think it’s for me, at least not until I have kids.